It was only the 12 February 2019 and I saw my first solitary bee taking nectar from the Viburnum tinus in the garden. Almost immediately I spotted another one, slightly larger, but not I thought the same species. The first bee is very much like a male to me and I was keen to get a photograph of the wing venation to identify it to genera level. I thought I had it and saw the second bee on the ground. 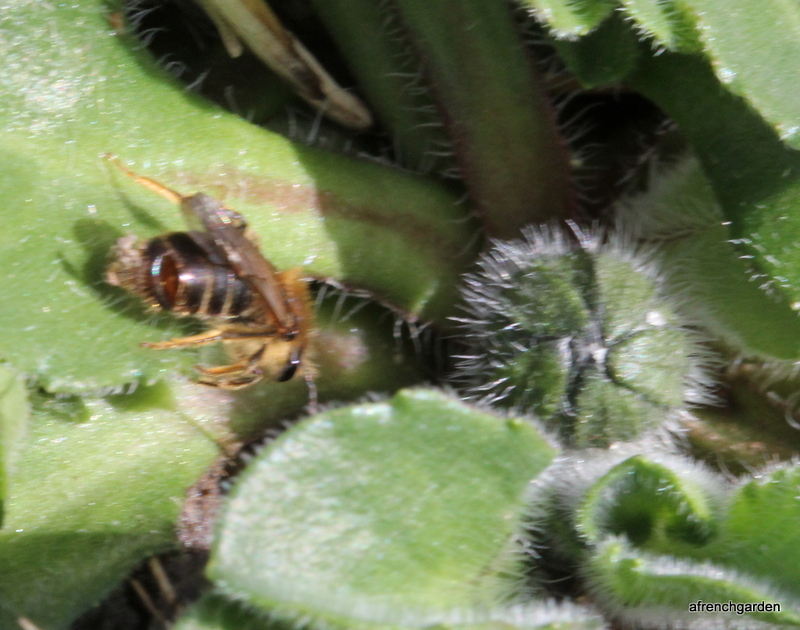 The second bee looked interested in prospecting the area. Looking out for females, I wondered? This is under our plum tree and there is already a colony of Andrena cineraria in residence that will put in an appearance later in the year but I could see no sign of any holes and I did not get a wing shot. Back inside I found that the wing venation photograph was not as good as I had hoped but I thought I could perhaps push through the identification key in Steven Falk’s Field Guide to the Bees of Great Britain and Ireland. When I turned up with the proposed ID as a bumblebee I realised I had gone adrift somewhere. Never mind, perhaps another day. Then the idea came to me that I could perhaps identify the huge white tailed queen that is with me throughout the winter on sunny days. But no – this too is past my ken. On the 12th. 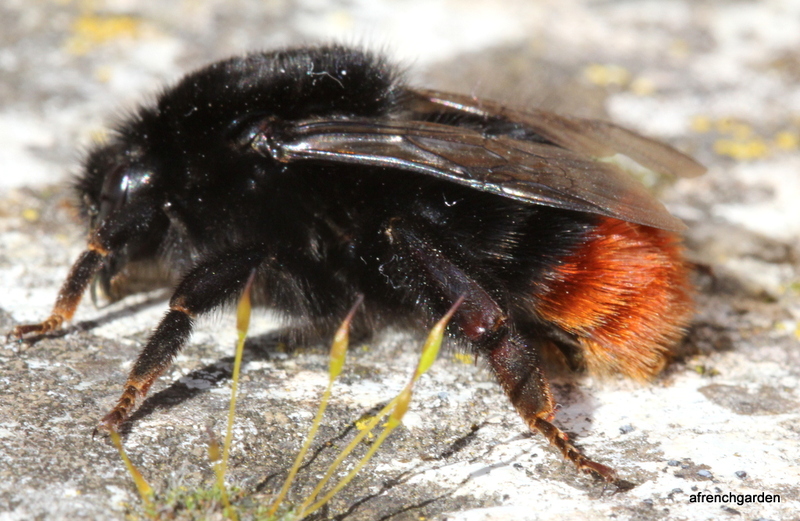 I had also seen for the first time the orange tailed queen. 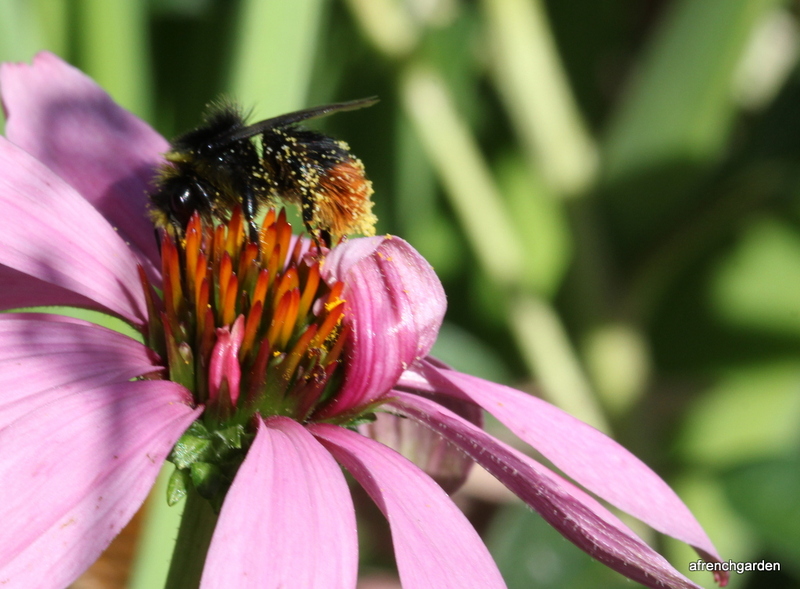 I am fairly certain this is Bombus pratorum, the early bumble bee. Today, 15th. February I saw my first carder queen. I am not even trying to go closer than that. I am just happy to see so many bees in the garden in the sunshine. 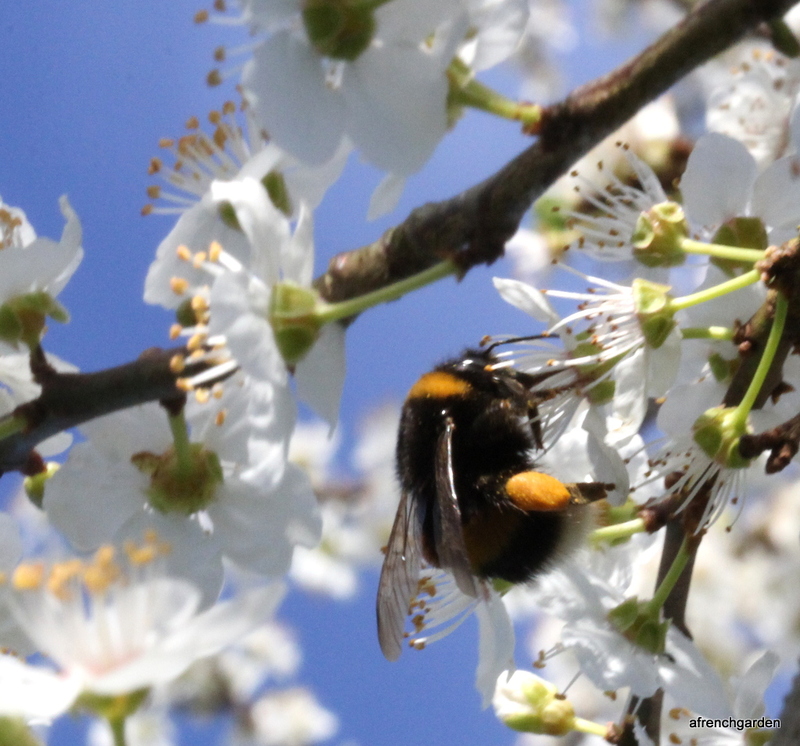 Today (21.2.14) I saw the first bumble bee in my plum tree with a very healthy looking pollen load. I’ve been seeing lots of queens throughout the winter but none were gathering pollen. This one has decided its time to start making use of the abundant blossom pollen that is around and start building a nest. The next first is not so nice so don’t look at the next two photographs if you are of a sensitive disposition. I noticed a tiny mining bee making a hole in the ground beside the stem of a daisy in the grass. It was not until I had looked at the photographs on the computer that I realised that there was a gaping hole in its abdomen. 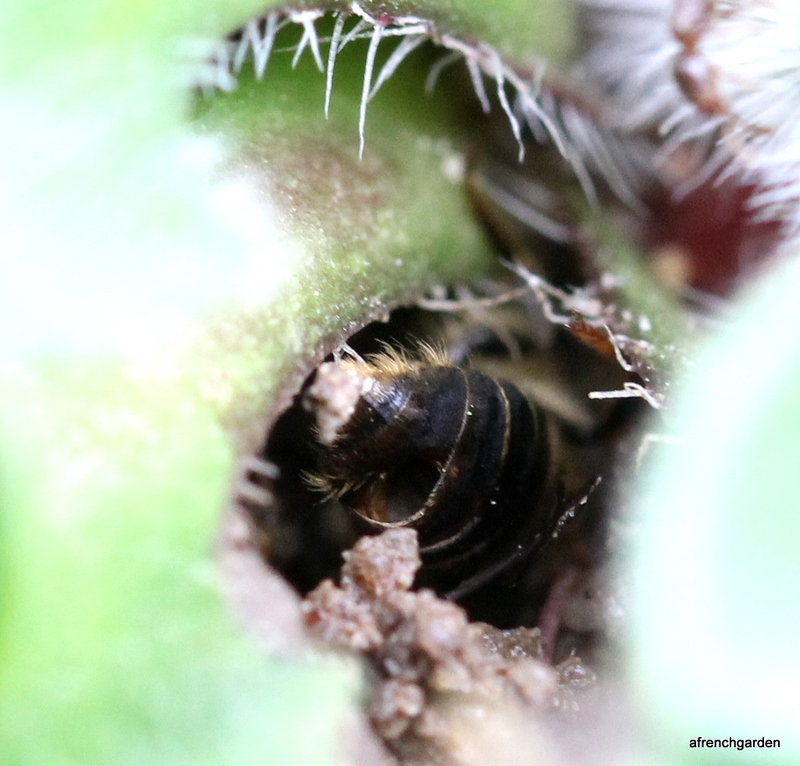 I suppose a parasite has made a meal out part of the bee and it will not survive for much longer. Passing on, I was surprised to notice several new heaps of soil underneath the plum tree which means that the first mining bees are emerging. It seems very early and I am not quite as far on as I had hoped in my reading. Last year there were two types of mining bee under the plum tree that I saw. 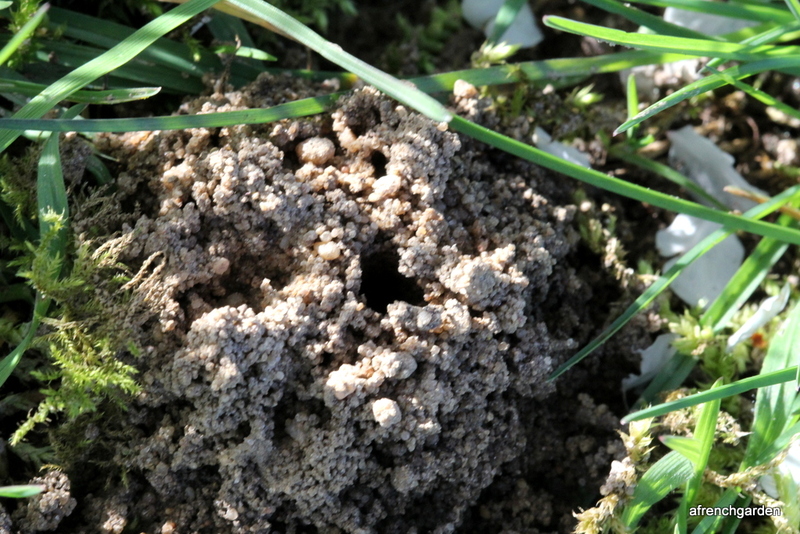 I watched the holes as much as I could but I saw no bees coming and going. 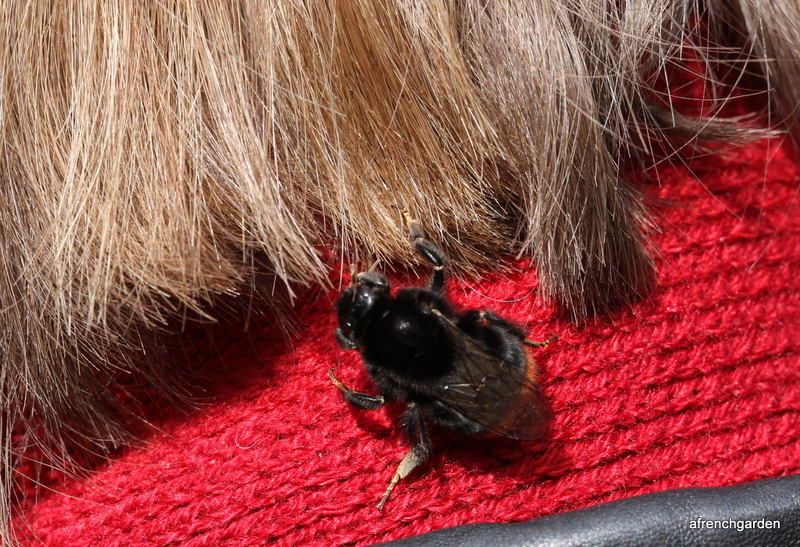 And fourthly, I saw my first Bombus lapidarius of the year. She was looking still very groggy from her winter hibernation and was walking around in the grass. In fact, I was getting a bit concerned for her well being and I tried to give her some sugar and water and I put her on a sunny stone step to warm up. She ignored the sugar and water but enjoyed the sunshine and finally lifted off with the grace of a vertical take-off jet. According to F.W.L. 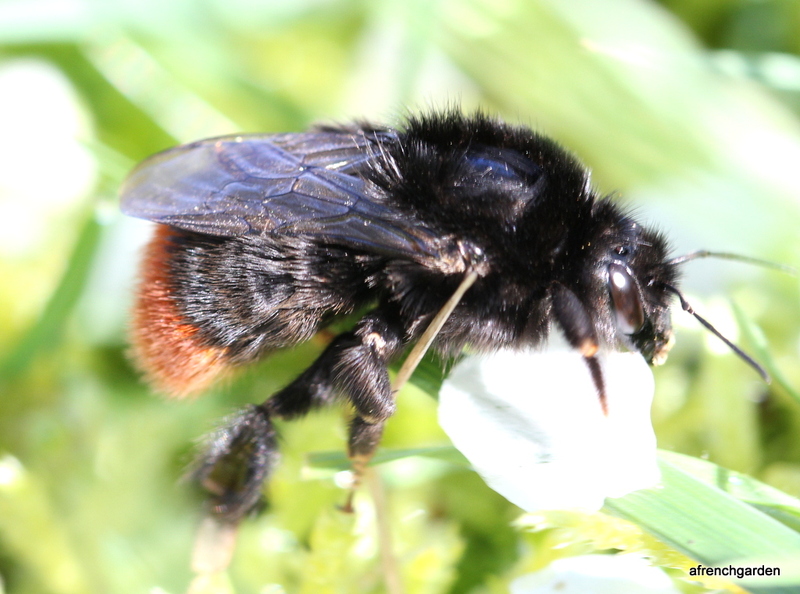 Sladen the only species I could confuse her with is Bombus ruderarius which although much rarer is very similar but has red hairs around the corbicula or pollen basket. 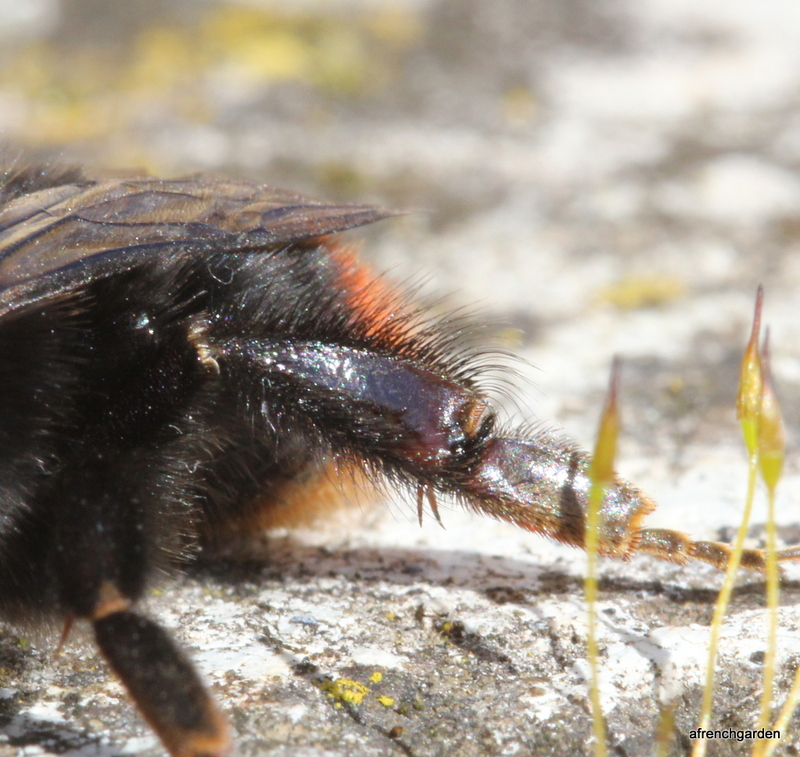 While she was sunbathing I got a good picture of her hind legs and the black hair, so I am satisfied she is Bombus lapidarius, or the red-tailed bumblebee. 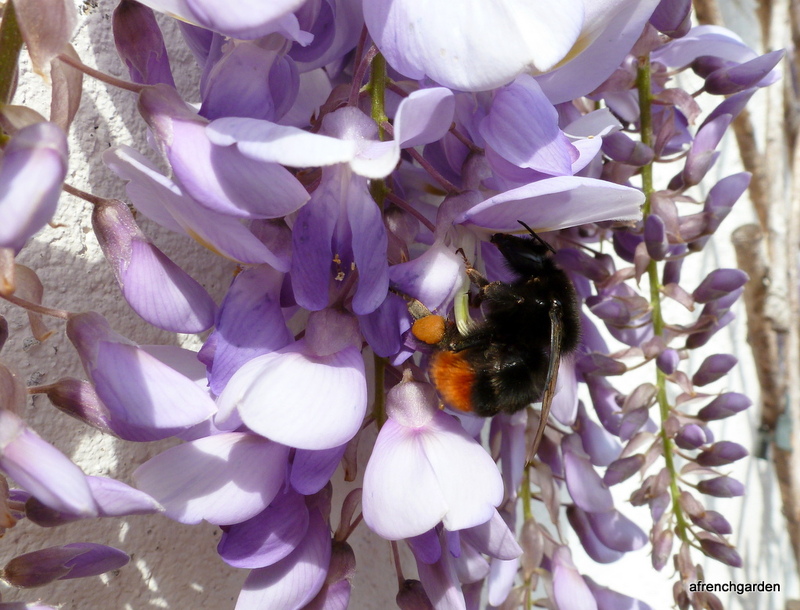 Like all the bumblebees she loves our Wisteria. This photograph is from August last year and shows the male. He has yellow hair on his face and a yellow band in front of the black thorax. I like bees and I’d like to think the feeling is mutual.